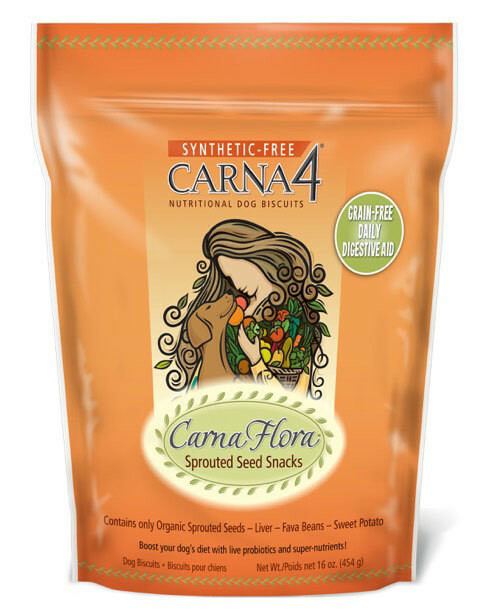 CarnaFlora Sprouted Seed Snacks are wholesome treats made from only sprouted seeds, fresh liver, fava bean and sweet potato! A great way to keep your dog really healthy with food-based, synthetic-free, grain-free nutrition, plus they taste great! CarnaFlora Sprouted Seed Snacks contain guaranteed levels of live probiotics (18 billion cfu/kg) and enzymes (1 million U/kg); effective doses of 21 essential vitamins & minerals; and high levels of Omega 6 & 3 fatty acids – all from true food ingredients. Ingredients: organic sprouted seeds, chicken liver, fava beans, sweet potato.